In the small amount of relatively free time we had on the ship we kept each-other entertained in many inventive ways. ..
One of the best things about free time was discovering people's hidden talents. None of us are one dimensional. We are all scientists/STEMM but we are all much more. We are all women but we are not only women. Some of us are professionally trained dancers, festival goers, yoga instructors, beautiful singers. The same person who said they did not feel like a leader in a board room would then jump forward to lead a whole room in a salsa routine. I'm so grateful to the women who shouted the instructions over the hum of the ship. And I am grateful to the women who whispered softly during morning yoga (which I managed to attend only once!). It was inspiring to see people's conviction to carve themselves a space in the busy schedule to do what they knew would make them happy. I spend a lot of my life thinking only about what will make other people happy, so seeing this self-valuing behavior role modeled was an important part of my learning on the ship. Sharing spaces was a challenge. All spaces were open and being used for multiple purposes at a time. Yoga for strength in the Media Room. Feel the power. The long floor space in the middle of the main Lounge room turned out to be perfect for line-dancing style Zumba – we would fit two lines of women doing the grapevine along there. The Media Room was good for yoga. Each one of us would fold into a different space on the floor. We were careful not to disturb people patiently using the very slow computers or working on the tables. 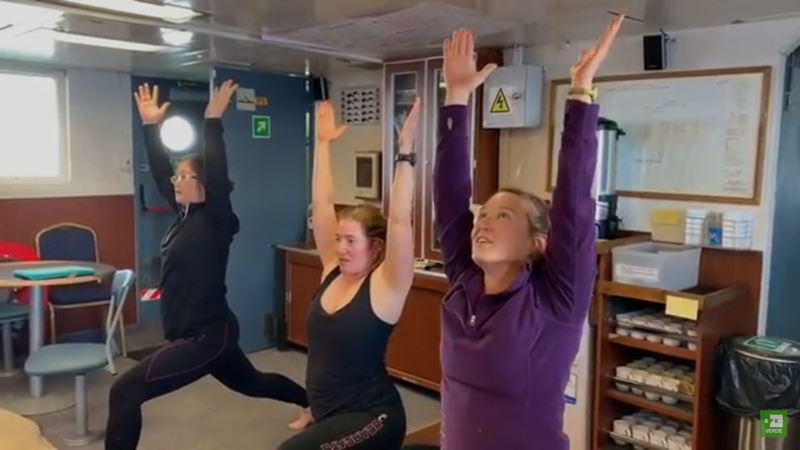 Doing yoga poses on a rocking ship was a real challenge to my core strength. It was great to get a glimpse into what people loved to do in their everyday lives. It leads to lots of discussion about how we care for ourselves, and how we balance this with caring for others. We all came to quite similar conclusions: we liked to move our bodies, laugh a lot and wanted to get more sleep! We also agreed this was all easier if it was part of a routine. 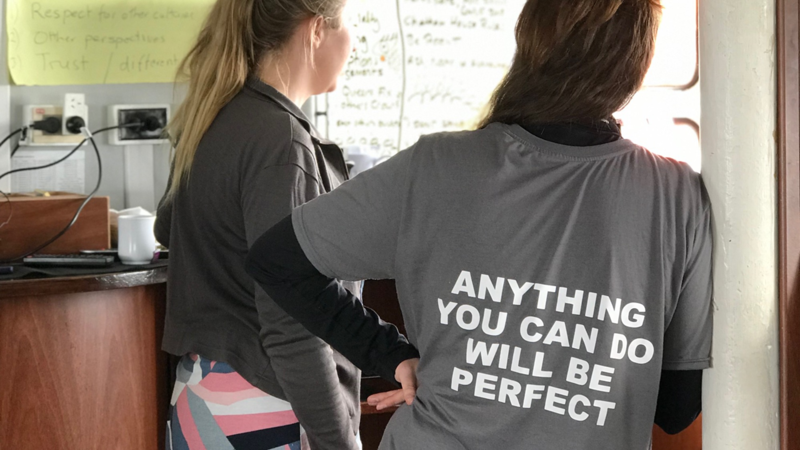 Having watched my own Mum work hard on her amazing physical and mental strength over the past few years with Benchmark Fitness, I was not surprised to see how important regular training and movement was to women from all over the world. Moving around helps your mind and your body. It reminds you of your power in times of vunerability. T-Shirt generously sponsored by Benchmark Fitness emblazoned with my motto for the journey. Thanks very much Mark - it encouraged many! Since returning to Manchester I have started doing yoga and Zumba classes and I love it. I have quit a couple of things I used to do for other people (jobs in which I was replaceable) and have borrowed back that time to love my body and move it about a bit more. I love Zumba and yoga because there is no pressure to achieve anything. Anything you can do will be perfect. We saw Gentoo, Chinstrap and Adelie penguins. These birds are icons of Antarctica and they are truly fantastic. They have wings, but cannot fly, but are at their best in the water, but rely on the land for breeding and nesting. They were a wonder to observe. 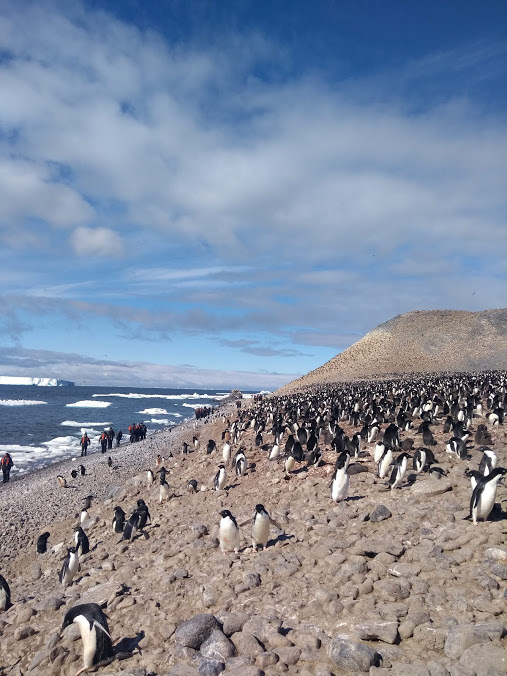 Adelie penguins on Poulet Island - one of our first landings. We had serious discussions before and during the journey about how we should conduct ourselves around the penguins and other wildlife. A key question we came to was: if we care so much in this environment, why not translate this care into our home environments? We also spoke about the concept/perception of Antarctica as a ‘pristine wilderness’. Is it really? If humans have changed the composition of the global atmosphere can there be any pristine places anymore? There are multiple tourist ships on the Peninsula every season making landings – is this ‘okay’? Research stations – current and deserted – are clustered on the Peninsula and scattered around the coastline of the continent. It’s a bit like Space in that respect: there is a bit more debris than you might expect…But it doesn’t matter either way. We should treat this pace with respect irrespective of its current state. We were lucky to have participants who were wilderness lovers, bird scientists and conservationists. Our heartfelt debates about our presence in this environment were informed, but filled with worry about our influence on the world. How could we tell what impact we were having if we were 10 m from a penguin, or 5 m or 1 m? Should we be here at all? To tread lightly on the land, marine and atmospheric spaces we visited we practiced quiet and silence, we walked on single paths in each-others’ footsteps avoiding ‘penguin highways’ and left no litter. Leaving only footprints. But even then, footprints into deep snow can then solidify and create an uneven terrain that a penguin might have to struggle through, because of us. We were not perfect. We made mistakes. When taking group photos sometimes we would get carried away jumping around in the snow. But we acknowledged this with compassion and made changes. After every discussion we realised – this is why we are here – this is why we need to be here – so we can see this landscape, feel the connection to this foreign place. Why? So we can take these stories home. So we can apply this concern to our own worlds. So we have the luxury of space and time to think about impact. So we know what is at stake when we talk about climate change. The birds are quite literally the ‘canaries in the mine’ for climate change. When you’re thinking about every single footstep you take, creating policy in government or business that protects the environment suddenly feels like the only way to walk forward. 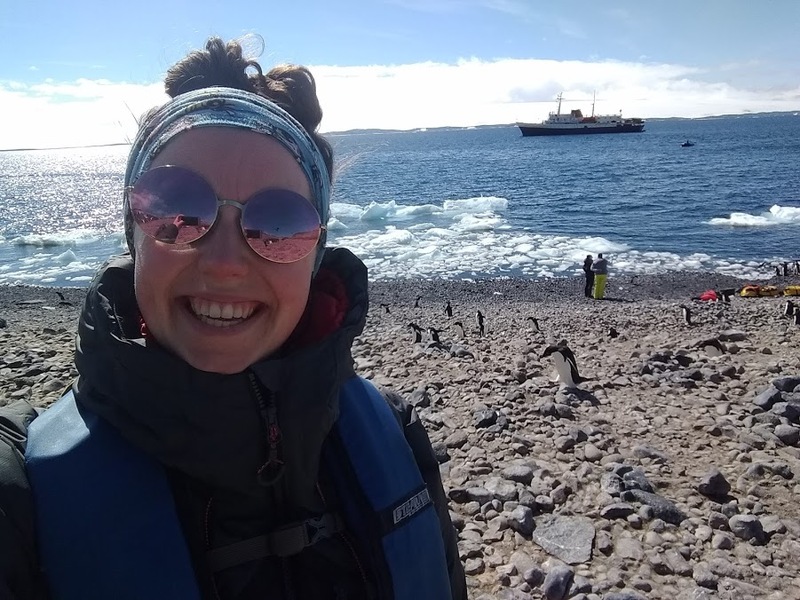 We were informed by the guides, who have been traveling in this part of Antarctica for years, about the changes they have seen in the wildlife. Gentoo penguins, that prefer slightly warmer water, are thriving and migrating further and further south on the Peninsula every year. They are then out-competing the Adelie penguins that usually live there. This will change whole ecosystem structures around the Peninsula. We were lucky enough to be visiting at the right time to see penguin chicks. Football sized lumps of fluffiness which lie on the pebble-nests made for them by dedicated parents. This reminded us of just how resilient these animals are. When the penguins in the videos and photos comically pop-up out of the water and shake off their feathers, they are not ‘cute’ but exhausted by hours of hunting to feed their chicks. This swim is followed by a walk up steep hills – yes! They can walk up really steep hills! They nest higher ground to avoid mini-tsunamis made when blocks of ice fall from the glaciers and offset the water nearby. I didn’t expect to find the penguins so interesting, but their presence kept our thoughts about the environment in sharp focus – as well as bringing us huge amounts of joy. Looking at the individual personalities of the penguins in a colony over a number of hours was a reminder that we are not so far removed from them after all. We all want the same thing: a safe home to raise our chicks. The Drake Passage is a stretch of the Southern Ocean between South America and the Antarctic Peninsula. Driven by the rushing circumpolar winds, the Drake is one of the roughest stretches of water in the world. 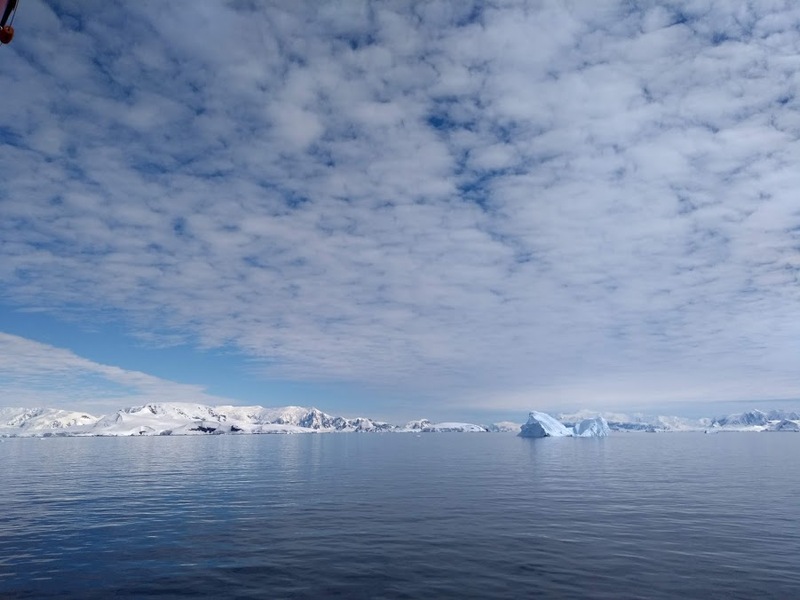 On our little boat (sorry, ship) we crossed the Drake to reach the calm that Antarctica promised. 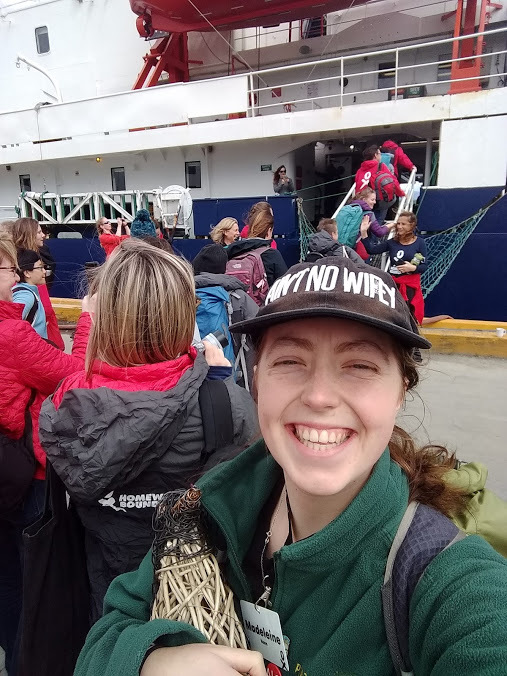 I don’t have any photos of videos of my own from the crossing, which takes 48 hours, because I spent the whole time in my cabin listening to Harry Potter audio-books. This was my strategy to not get sea sick and it worked perfectly! I propped up the mattress on my bed so I couldn't role out, I put water bottles and a Botham's of Whitby Ginger Brack cake next to my and settled in for the ride. It did mean I missed out on seeing albatross and rolling waves but it did mean I got to the other side fit, healthy and very well rested. My very first ice-berg sighting! 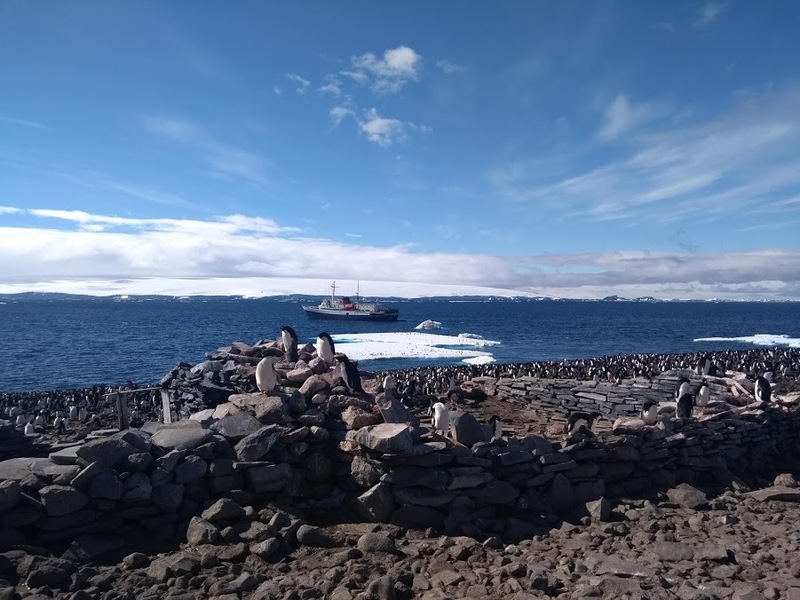 View of the MV Ushuaia from Gentoo penguin colony on Poulet Island, south of the Antarctic Peninsula. During the 3 week journey around the Antarctic Peninsula I had the pleasure on living the MV Ushuaia. The Ushuaia was described by the captain as “Not the prettiest ship in the harbor…But definitely the strongest”. A practical and reassuringly sturdy ship, the Ushuaia withstood 70 knot winds and 12 m high waves on our crossing of the Drakes Passage without any complaints! To see the spaces the Homeward Bound team used to work, rest and dance together have a look at this tour of the ship. Or see more technical detail of the ship here. We shared cabins throughout the journey. We swapped cabin mate half way through. I had two fantastic cabin mates who were both fascinating people. We got along well (at least I thought so!) and laughed together every time we heard the shout of “wakey wakey expeditioners!” over the ship’s loud-speaker in the morning. It was a privilege to spend time with Marji (Australian Marine Biologist) and Colleen (South African Conservationist) and learn about their lives and families while we supported each other through the journey. There were two big group spaces on the ship: the dining room and the lounge. The lounge was where we spent most of our time. This was where we did group work, listened to presentations and spent any small amount of free time looking out the window at the ice floating by. In the lounge we would sit on the floor, or packed close together, and we would constantly change seats to meet new members of the group. Helen Wade (Sea Bird Scientist) addressing the team while working together in the lounge on board the ship. The deck of the ship was also a very important place for me. You could was the circumference of the deck in about 30 seconds. Every morning I would try and get up to see my surroundings before breakfast, take in the light and sometimes spot a whale! There would usually be a few other people doing laps of the deck at the same time. Passing each other on our walks and waving hello felt just like walking to work! 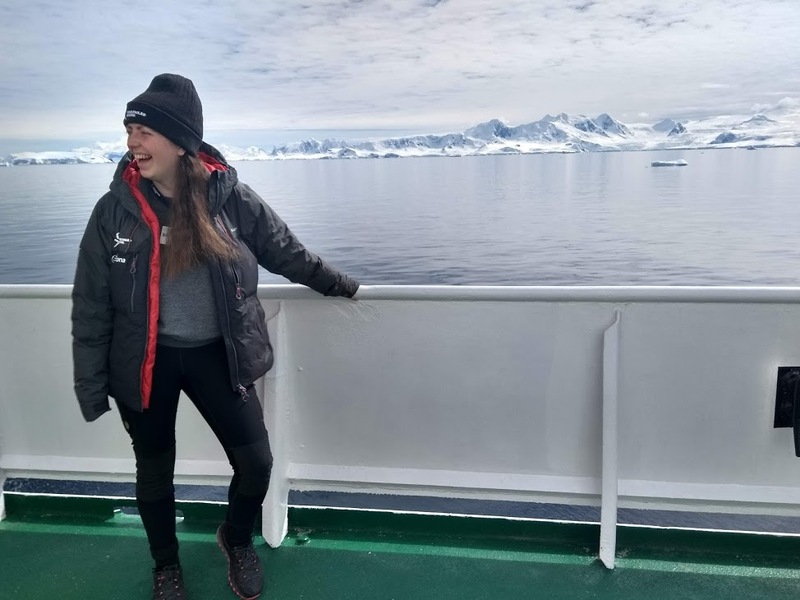 Me enjoying the ice and calm seas on arrival at the Antarctic Peninsula after the rough crossing of the Drakes Passage. The ship had an open bridge, so we could watch the tricky navigation between islands and ice. We could also get an amazing view of the dramatic landscape. The crew of the Ushuaia were incredibly friendly and hard working. They knew all our morning coffee (and evening wine) preference and were always excited to tell us about their experiences in Antarctica. The Ushuaia was our nest and container. It kept us warm and safe and took us to special places. It created a space, away from distraction, where we could be open with each other and find space to grow. Being taken away from your normal environment makes you feel vulnerable but also encourages strength. One of the main lessons we learnt of the ship was that knowing yourself, even in strange waters, helps your anchor hold in the storms of life. 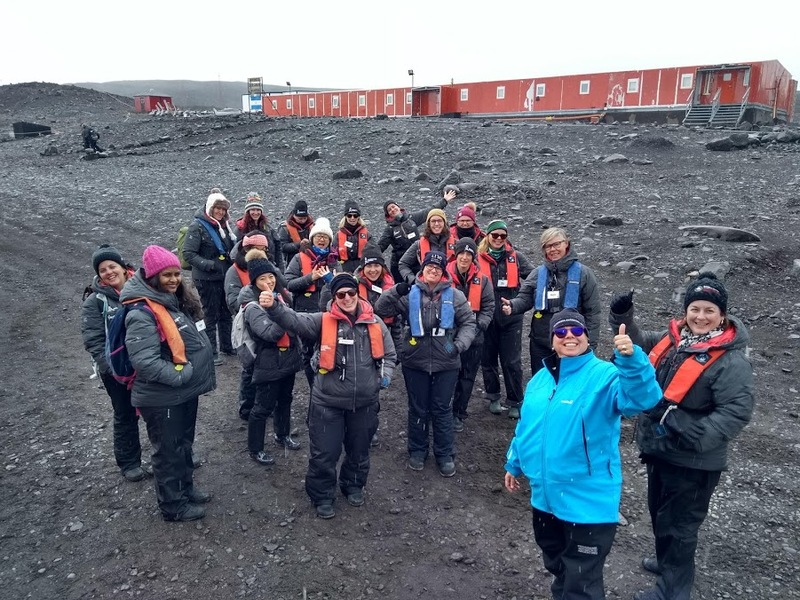 Thank you to the crew and my cabin mates for making the ship a wonderful platform to learn about Antarctica and leadership for women in science. Hello Supporters and Happy New Year! Edith (my penguin mascot) and I visiting a Gentoo Penguin colony. 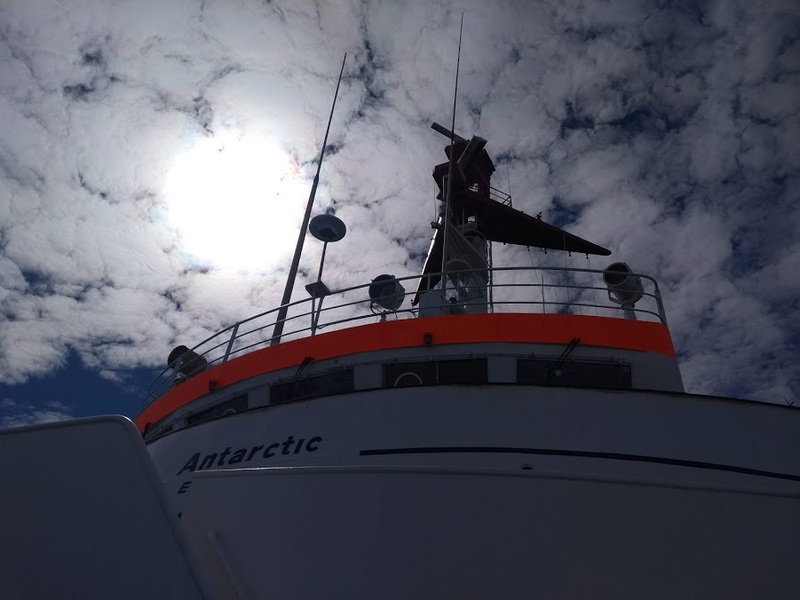 A week ago I arrived back from Antarctica. (After some rest and decompression) I am excited to share as much as I can with you. It’s hard to know where to being, so I plan to share photos and stories from the expedition with you throughout February. 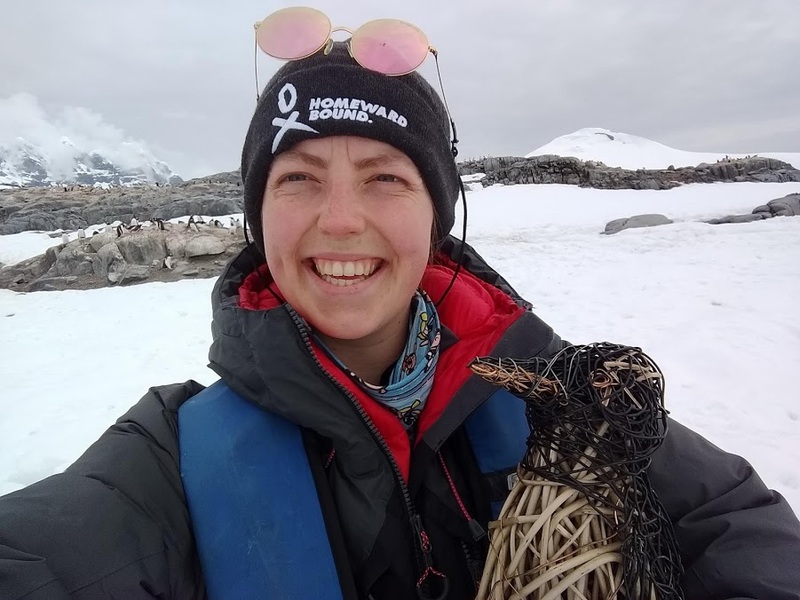 Today I would like to introduce you to the team: My fellow members of the 3rd Homeward Bound cohort (#TeamHB3) to take part in the transformational leadership training program in Antarctica. We are all self defined women, and all members of the STEMM community (Science, Technology, Engineering, Mathematics and Medicine). We range from coral biologists to town planners, firefighters to pediatric surgeons. We range in age from 23 (me!) to 55 years old. We span all life situations: from an unemployed graduate with a vision to an entrepreneur who just won Chinese Businesswoman of the Year. See profile of the whole team on the HB website here. Some of the team visiting the Argentinian Base, Carlini, on King George Island. The knowledge that the contributions of women are crucial to solving global problems. The acceptance that climate change is already damaging lives of people all over the world and commitment to finding solutions. A shared belief that we are stronger together. 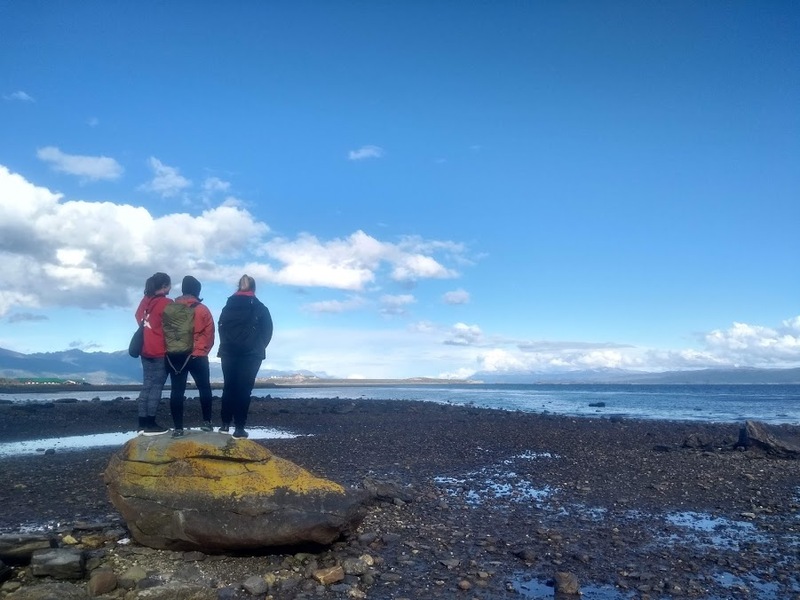 Fellow young participants Daisy (Nature based Solutions Support Officer), Steph (Marine Biologist) and Sarah (Geography Teacher) looking towards the Beagle Sound and ready for the journey to Antarctica. This would not be possible without your generous support. If you have specific questions or topics you would like me to include please let me know. 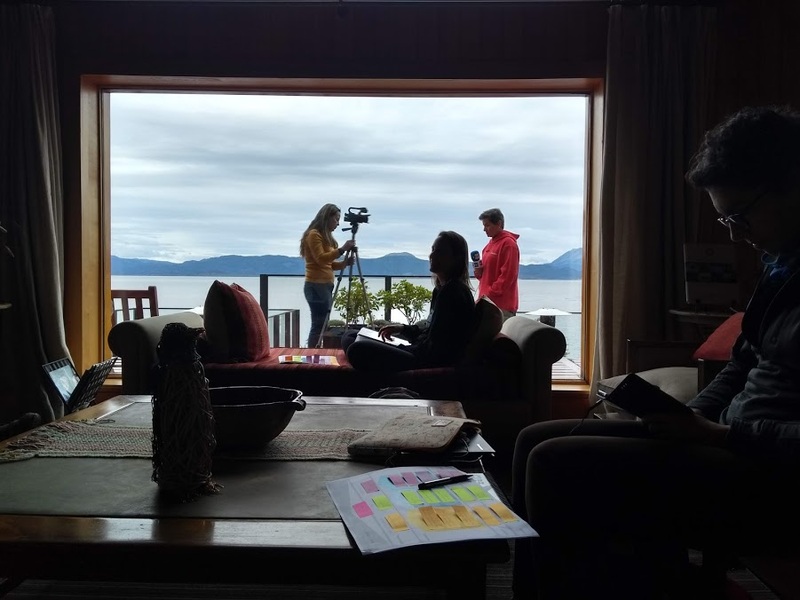 Free time to work on our Personal Strategy Maps (details to come) and pre-voyage media coverage at our hotel on the beach in Ushuaia, Argentina. Any liquids, laptops or penguins, please? Thanks to you all I am on my way to the South at last. After a brief trip to London and some final reassurance from some very high quality friends, as well as many in attendance at the FCA Christmas Party I went home to Whitby to celebrate Mad-mass. While I was in Whitby I was very excited to have the wonderful and incredible talented Emma () deliver my mascot for the expedition. Meet Edith the penguin. She is lovingly made from willow, copper wire and steel. Appropriately named after the first woman to explore Antarctica (accompanying her husband), Edith with accompany me everywhere on my journey. I also managed to fit in a quick family work out with Mark! 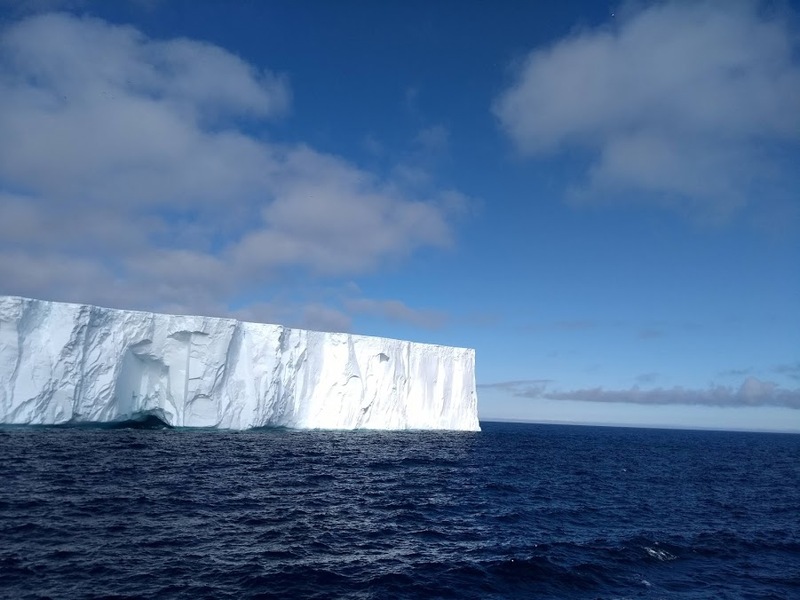 We will travel from Whitby, to Manchester, to London, to Buenos Aires, to Ushuaia, through Drake’s Passage and onwards to the Antarctic Peninsula. From the moment I land in Buenos Aires I will begin to meet up with soon to be friends who will be on the journey with me. When I reach the Antarctic Peninsula we will be able crack open the most well travel bottle of Scottish gin ever, gifted to me by Phil and Tabitha from the Pentland Hills! (While wearing my matching bright green fleece!) Thanks P+T, can’t wait to share it amongst the ice bergs. But for now I am waiting in Heathrow in anticipation for my 13 hour flight. I am also doing some final work on my group presentation about women and climate change (part of the problem and part of the solution). Nothing like a bit of last minute preparation! Thank you very much again for your amazing support and all of your Merry Christmas messages today. I really could not do this without you. All the best and see you soon. Sending hugs to may family and friends. Thank you for all of your cards and useful gifts, they are keeping me company. PS. I am trying to add many photographs but the WiFi in Heathrow is not happy with it! So I'll send this now and photos to come when I hit Buenos Aires! 2 more days of crowdfunding. Help me reach 150 supporters? Thank you very, very much for your support which has made this process an absolute joy and worth all the time and hard work. I cannot thank you enough and I'm really looking forward to sharing all the rewards and stories after the journey. I'm not on the hunt for 3 more supporter to bring us up to 150 strong! Only 2 more days to go! As part of my journey I have had support from many wonderful organisation and people who share the values of my expedition. One of the main aims of Homeward Bound is to bring women in science together to work towards a sustainable future. Sustainability is a core value of the brand-shining-new Scottish handcrafted Pentland Hills Gin. I will have the delight of bringing a bottle of the recently launched Pentland Hills Gin along with me to Antarctica. This will be my 'desert-island' luxury item and will be something I look forward to sharing with the other women on the ship - bringing them a drop of very British culture to enjoy! I'm heading up to Edinburgh next week to pick up the precious cargo -can't wait! - Working with a group of 5 women from Iceland, South Africa, Switzerland, Australia and USA on our research theme of Gender and Climate Change. - Learning my learning style and how to make a presentation which speaks to a range of learning styles. According to my results I fit a 'Dynamic Learner' profile and am focused on the question "WHAT IF?". - Working on visibility and practicing writing a 100 word bio following a 'Goal, Audience, Message, Platform' planning structure. - I had my final 1-2-1 coaching session before the journey. Talking about my values and how this influences my behavior and effectiveness. In my '360 feedback' which informs the coaching, I scored in the 92nd percentile of the the international norm group both for 'self-actualizing' (making things happen and initiating) and 'approval' (placing high value on the approval of others and seeking their approval). It has been fascinating to see how these aspects of my behavior affect my day to day life and how I can manage and maximize them on the ship. - Thinking about 'anchors'. Memories, experiences, thoughts and relationships I can go to to give me confidence during this process. - Planning how to use my 3 minute 'Symposium @ Sea' presentation slot. I plan to open my talk with "Put your hand up if you've ever been to a river..." and maybe I'll being to some sand along to demonstrate sediment transport. - Attended the wonderful RSMA Dinner in London to catch up with new and old friends and say thank you for their generous support - from individuals and the RSMA as an organisation. Thank you. - Organizing what equipment to bring and what home comforts to justify transporting half way across the world. So there is lots going on! 4 very generous people have sponsored me to wear a t-shirt with their face printed on it some they can truly be with me on my expedition! I am looking forward to receiving their chosen photos and getting the t-shirts printed. £5000 in only 2 weeks. Thank you. You're Amazing. I have been away this week in my field study area in the High Atlas of Morocco. 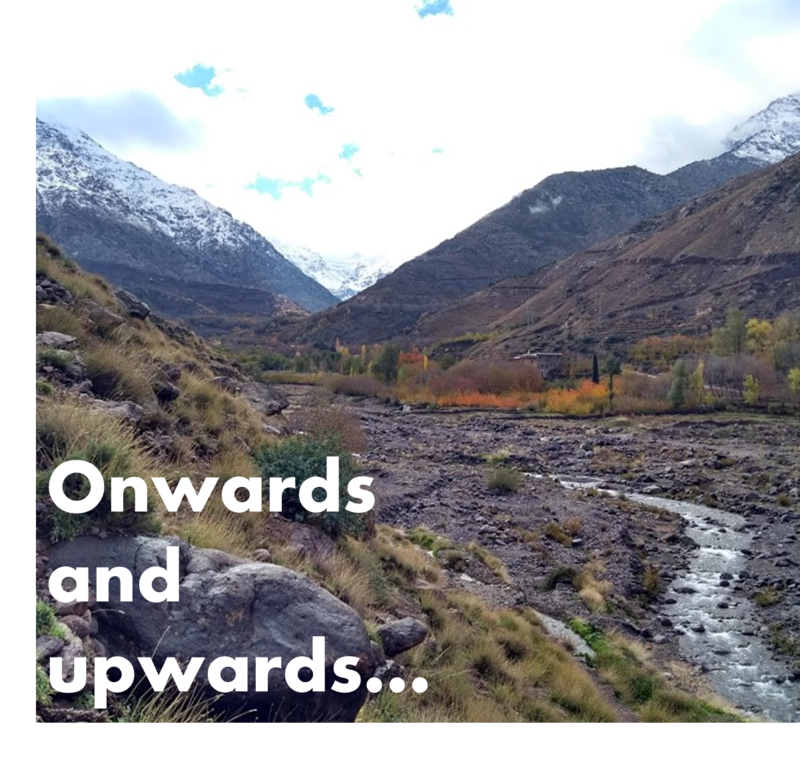 I am looking at the control that changing climate has on river behaviour in these mountains. It is exciting work and a lot of fun. The time period I study is the last 2.6 million years, know as the Quaternary Period. 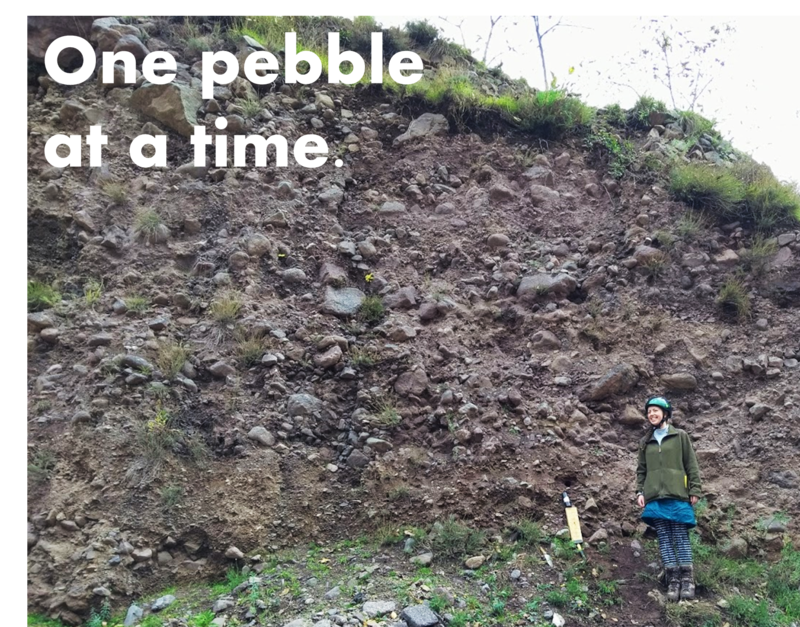 In practice, this means walking around the river valley, looking for piles of sand, pebbles and boulders that have been deposited by the river over time, which have then been exposed as the river cuts down into that material. There is a continuous cycle of build up and down cutting. When and why the river switches from depositional to erosional is one of the aspects of behaviour I am interested in. I would like to say thank you to my PhD supervisors, Phil and Jamie. 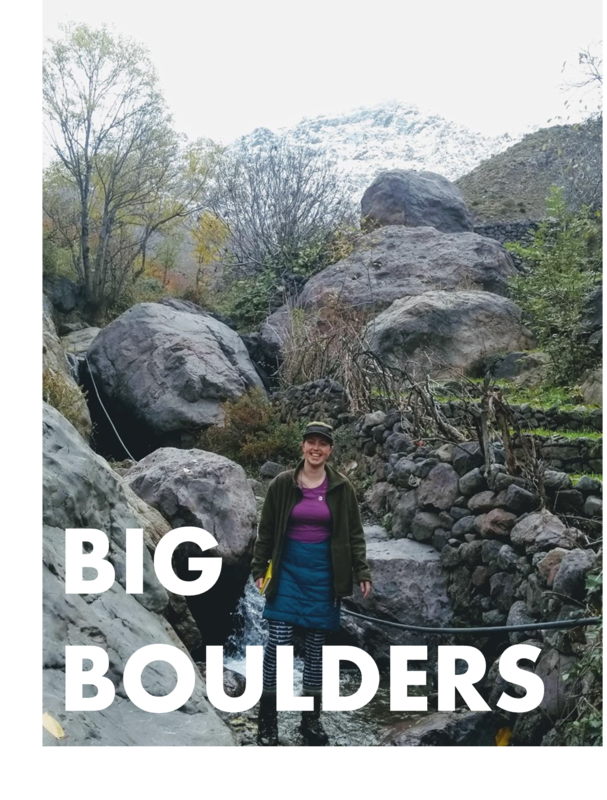 We had a fantastic field trip, with just enough sand and big boulders. Without their endorsement I would not be able to take part in the Homeward Bound leadership program or travel to Antarctica. They are trusting me, as you all are, to make the most of this opportunity, and I could not be more humbled and grateful. We had very little internet so I didn't realise for some time that I had already exceeded my initial target! As I have noted before, I aimed to raise £5000 to support my journey to Antarctica. I chose this amount as I knew I needed to balance fundraising with my PhD work and life. I never expected to reach the target so quickly and with so many individuals and organisations. However the total cost of the expedition in ~£12,000. So I will continue to fundraise for the duration of my campaign. Every little helps. Yesterday I had my final coaching session before the Antarctic Expedition. I have had 4 2 hour sessions with Helen from Human Synergistic over the past few months. These coaching sessions have been a luxury I would never have dreamed of at this point in my careers. I can already see the impact the coaching has had on my understanding of my own behaviour, how I affect others and my effectiveness. Thank you Helen. Having the backing from almost 150 people is the kind of encouragement and endorsement I could never have anticipated. I think this demonstrates how gender discrimination and bias affect all of our lives and the time is now to proactively make change. 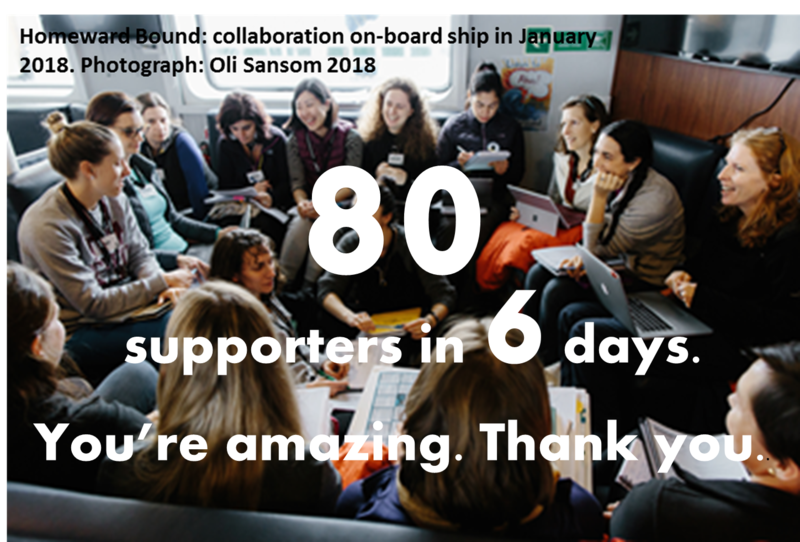 I am proud to represent you all in the international cohort of 80 women on this expedition, and among the 1,000 strong leaders who will take part in Homeward Bound. 93% of target reached133 supporters so far. 16 days left to go! Tomorrow afternoon I'm going to the village of Imlil (3000 m a.s.l.) in the High Atlas of Morocco. I am studying the rivers around this area for my PhD: looking at the impact of glacial/inter-glacial cycles on river behavior over the past 2.5 million years. This will be incredibly important fieldwork for me, accompanied by my two supervisors. I will be collecting samples to date (get the age of) the river sediments I have been looking at. I will then spend the rest of the winter (while not in Antarctica!) working in the geography labs of Sheffield University to process my samples and eventually derive an age using a method called optically stimulate luminescence. These dates will then allow me to start to reconstruct the history of environmental change in my study area. I am always thinking about why and when things happen. I will have almost no internet so will be away from the crowdfunding for the next 4 days. When I return, with may photos and stories from the mountain, there will be 10 days left of my campaign. I am £320 away from my target. So I will aim to raise £32 per day! As a result of the run-away success of my campaign, and the importance of my campaign topic, I will be features in a few articles from the social responsibility team, university wide postgraduate communications and the careers service at The University of Manchester. I'll post a link to those when they come out! 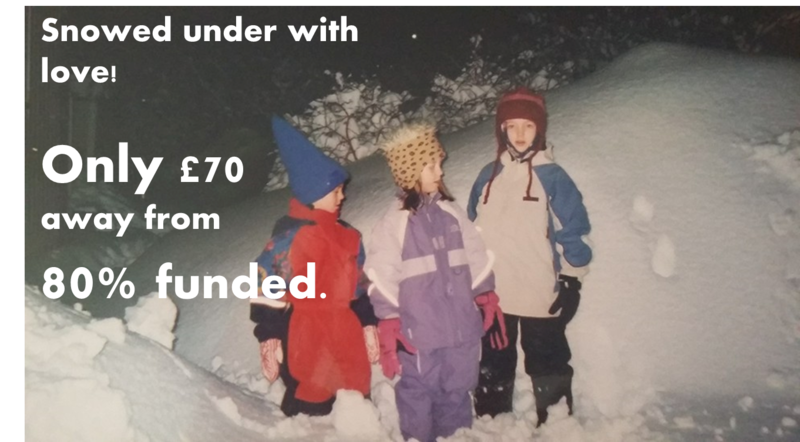 This is in addition to the support I've had for the running of the crowdfunding campaign, and the support of the Social Responsibility team in the School of Environment, Education and Development. 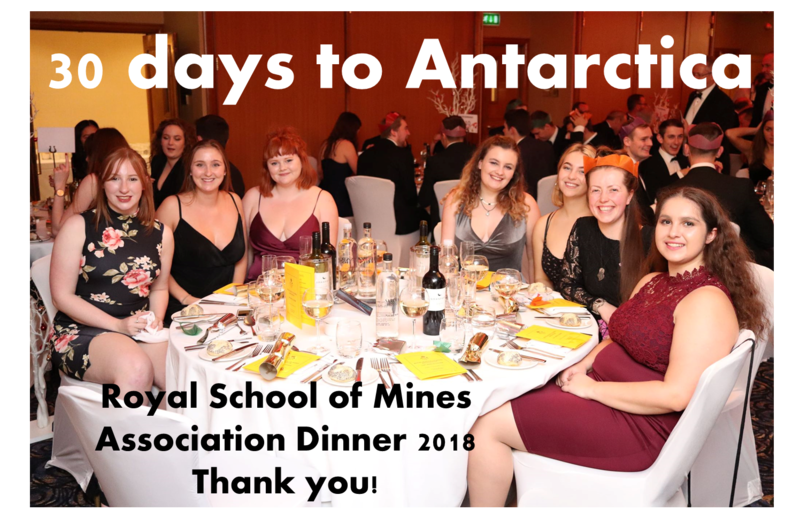 I am delighted to say I have received generous support from the Royal School of Mines (RSM) alumni community. Before starting my PhD I studied at the RSM at Imperial College London for 4 years. As well as fellow alumni, current students and staff have been amazingly supportive of my campaign and message to promote women in science. I will going to London next Friday to visit some friends and colleagues in the RSM to day THANK YOU in person and attend the RSM Association Alumni Dinner. None of this would be possible without your help and encouragement. I would not be able to go Antarctica if it wasn't for you. Thank you very much again, and look our for some photos and videos from Morocco when I get back! But it's not all about the expedition. In the lead up to the 3 week voyage in Antarctica I have been taking part in many, many other activities. 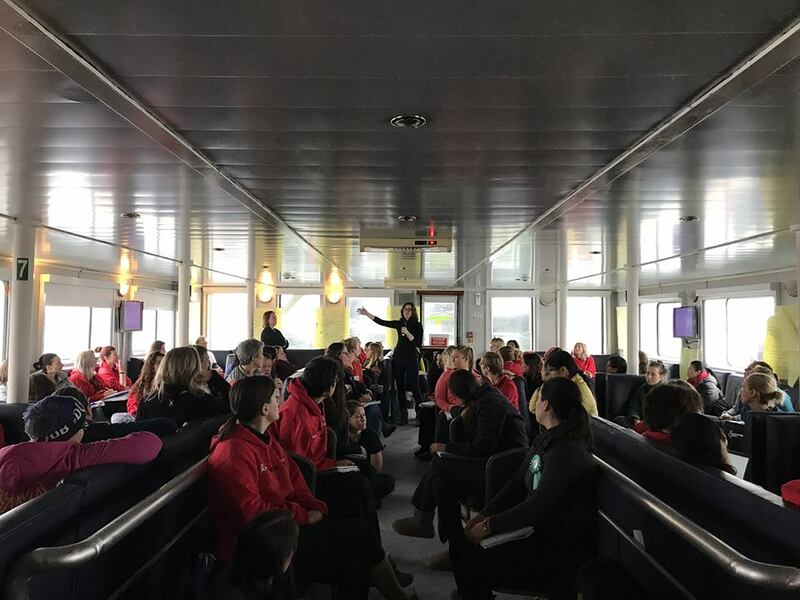 Personal development and group work, sustainability focused and leadership focused discussions, and getting to know the 79 other women and mentors who will be on the ship. How we can increase our visibility in an effective way to help us achieve our goals. Thinking about our core values, as a pre-cursor to developing our personal strategies once we get on the ship. Exploring key research themes in small groups. Each group is creating a 30 minute presentation for on-board the ship and a resource for other participants to use after the expedition. This is all about sharing knowledge with each other. Our research themes include education and awareness, climate change and gender, and environmental governance. Creating our own individual 3 minute presentation to be delivered as part of the Homeward Bound Symposium @ Sea. This is a chance for us to describe ourselves, what drives us, and the work we do. It’s an opportunity to create collaborations and identify people to network with. Undertaking one-on-one coaching sessions to explore what we do well and where we can improve to become more effective and successful leaders. Connecting with mentors from previous Homeward Bound programmes who are guiding us through the work we’re doing as part of Homeward Bound and helping us prepare for life on the ship. So lots and lots and lots going on. 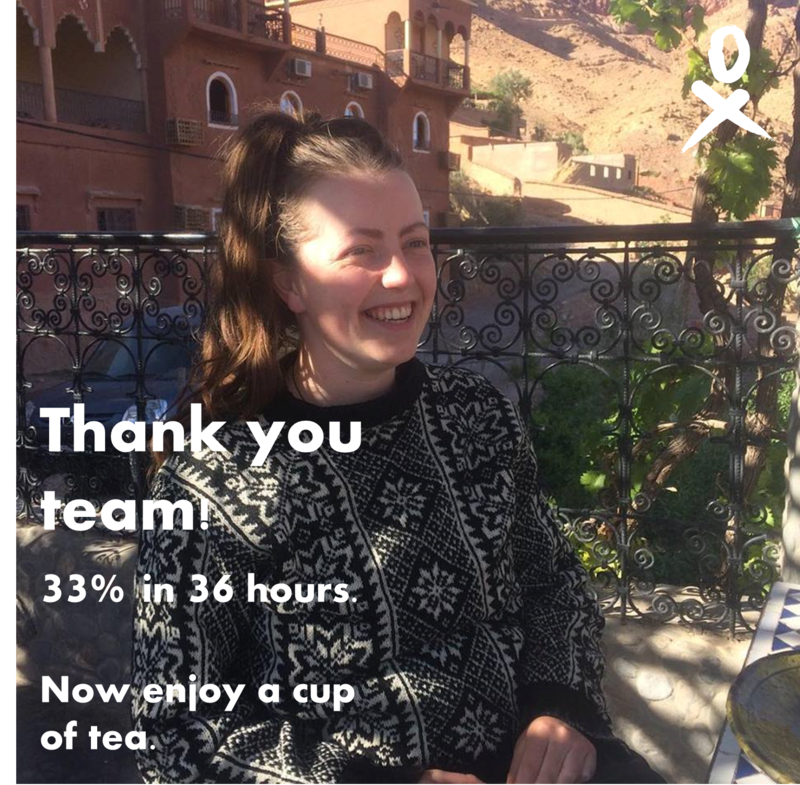 Thank you for your wonderful support - we're almost there! 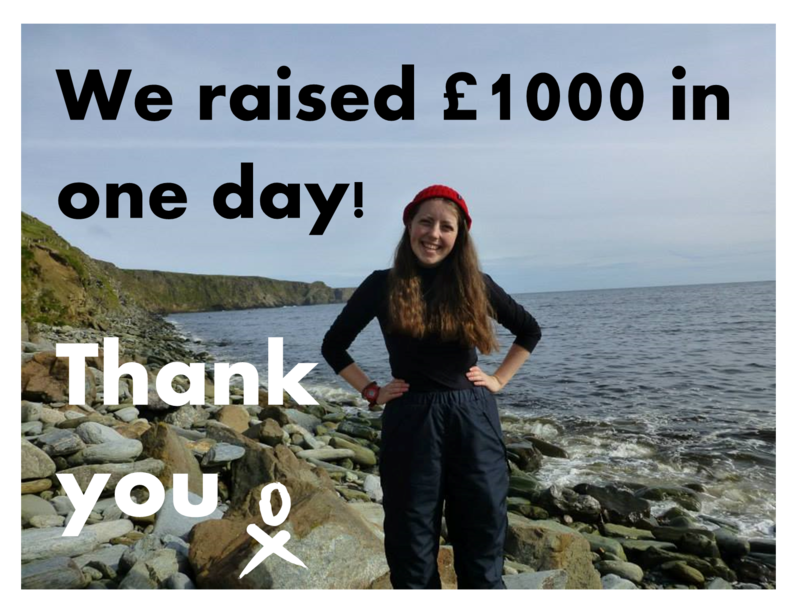 Passed £4000 - what a dream! 1)That we are brave and willing to push our limits - especially in the Antarctic which is a place that pushes many limits. Historically this has been done by many extraordinary men, but men only. 2) We have been sponsored with equipment by Ocean Positive, a sustainable swimwear brand making sea swimming equipment from discarded fishing nets. Plastic and the ocean can be a damaging combination, but this is also a reminder of the amazing things we can do with plastic when we use and re-use it responsibly. 3) We will be wearing yellow swimming cap for 'Teach a Girl to Swim'. This project is teaching basic survival swimming to young women and girls who otherwise would never be taught to swim due to modesty and cultural norms. Being able to swim empowers women and helps save lives. 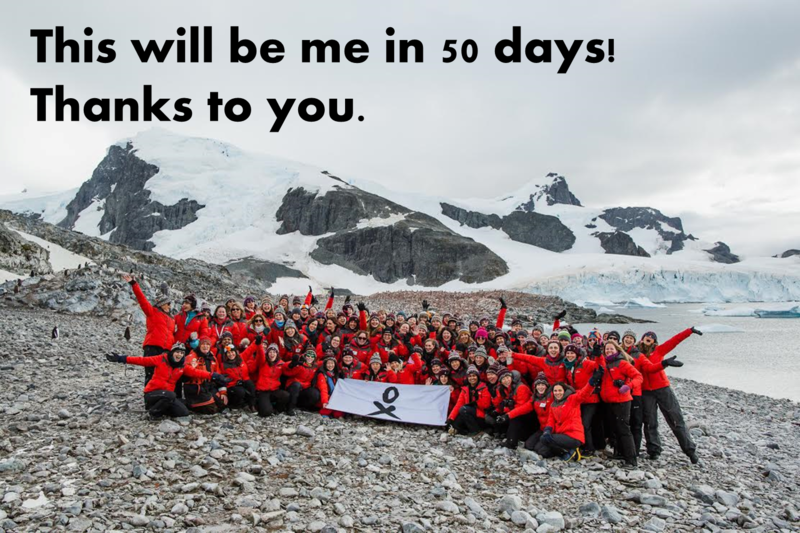 I look forward to sharing videos with you all on my return from Antarctica! So it's the end of the first full week, day 8, and I cannot thank you enough for all your love and support. I am tantalizingly close to 80% funded and gearing up for the home straight towards fully funded. Something I never thought we could achieve so early on. Highlights of the past couple of days have been approaches for sponsorship, support from my University alumni association (more to come on that) and kind encouragement from amazing people on Twitter: Prof. Jamie Woodward @TheIceAge and Prof. Alice Roberts @theAliceRoberts and good friend Heidi R. Macpherson, PhD @heidimacp. I've been back home in Whitby today and it's been lovely to catch up with friends and family. I'm currently writing an article to go in the Gazette. I'm also doing a couple of collaborations with Whitby based people which I will do a dedicated update on when all this busy-ness has calmed down. 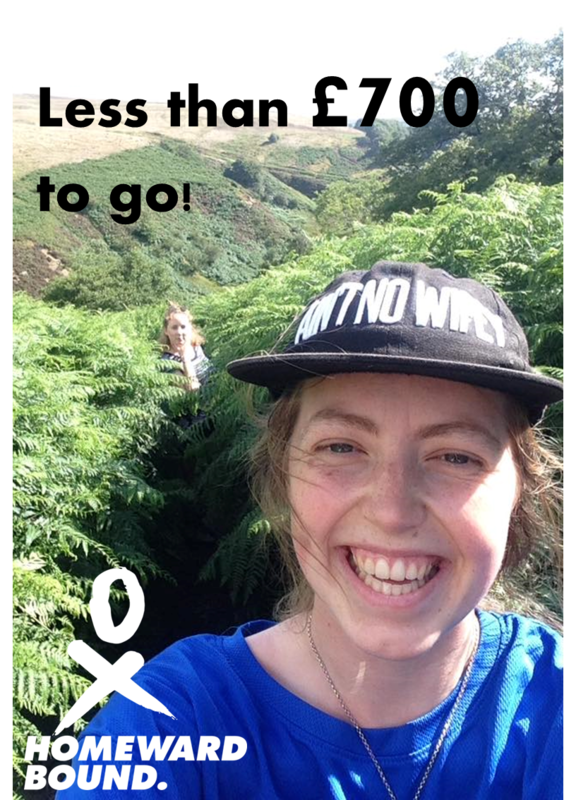 If you'd like to help me reach my target (maybe even by the start of next week??!!) please send one direct message to one friend who you think would be interested in the project - you may even know someone who would like to take part in a future expedition? End of day 6. 80 supporters. 56% funded. Thank you. Today I was interview by the University of Manchester as one on the most successful starts to a crowdfunding campaign they have every seen. My story and campaign will now be sent out University of Manchester Alumni, which is a huge success! Thank you for making that happen. We reached 50% in 5 days which was a reflection of the kind and generous response I have had from so, so many people. Receiving pledges from people who have never met is very special. Crowdfunding works by reaching out to the largest number of people possible, and I thank you for reaching out to your networks to support this project. Telling your friends really has an impact. I went to visit the global engineering company ABB Group yesterday and spoke to the director of UK and Ireland Robotics and Motion. They currently have a 1:30 ratio of women to me applying for jobs. They want to change but they don't know how. We spoke about schooling, we spoke about cultural change, we spoke about systematic barriers like paternity leave, we spoke about supporting women with networks, we spoke about diversifying the way you recruit. So I do think I had an impact there. I will continue to work hard towards the £3000 mark this week. Thank you again for your early support. I hope you can see the great start we have had and the positive knock on effect you have had! I'm sitting at my kitchen table enjoying a moment of calm. Thank you again to all my 'first followers' and welcome to new supporters! You're encouragement at this early stage makes all the difference to the campaign. Yesterday, we saw the campaign take on a life of it's own, including a chain of emails ending with the director of the British Antarctic Survey sending me a personal 'Good Luck' wish. 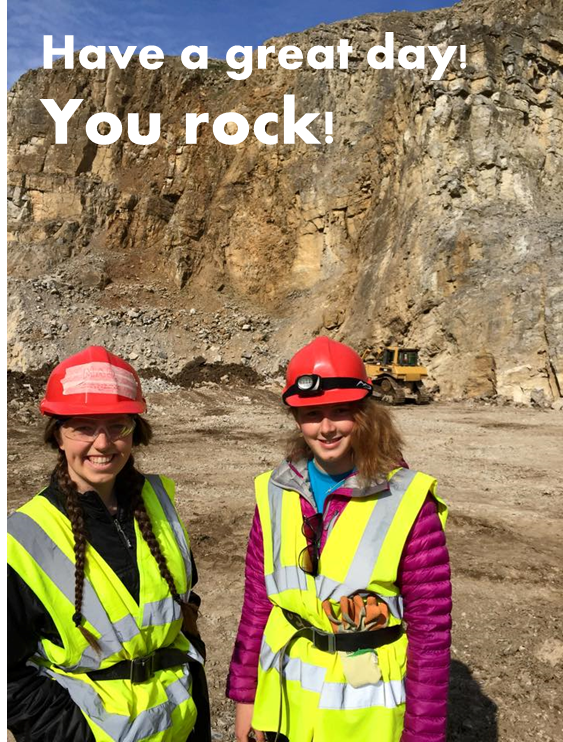 Geoscience communication super-stars Chris Jackson and Iain Stewart gave wonderful support on Twitter, along with many others. Brian Cox (who lectures at Manchester just down the road from me!) gave me a stiff ignoring...I will be chasing him. I was delighted to see friends and family spreading the word to like-minded potential supporters. It really takes the campaign to the next level. Reaching out beyond my initial network is key to success and making change happen! So thank you! Many new lines of inquiry came up yesterday, from many unexpected directions.I have some fun collaborations on the horizon. I will keep you informed as things develop. In under 24 hours we have raised over £1000 with 30 supporters, exceeded my minimum funding target and almost reached 25% funded! Thank you! Thank you all for your amazing support. Showing support this early on makes all the difference and gives wings to the rest of the campaign. I will embrace every element of this training program and I won't let you down. I am excited to see so many of you choosing rewards. I will be doing a polar plunge (thanks to an anonymous donor! ), will where a t-shirt with Neil Blannin's face on it and send many post cards. I'm looking forward to all this, and writing so many names in the snow, we will have no contact/internet while in Antarctica so it will fun to remember the people who has supported me. Today, on my second day of crowd funding, I aim to reach another 30 supporters. Knowing people believe in the expedition and the importance of women reaching leadership positions in science is incredibly encouraging. If you would like to use this link: https://spsr.me/ezXk to share the campaign with just one other person, I will be able to see how many clicks you can generate!